After a long period of heart and soul cultivating, it is a wise admonition to take heed: guard the field you have cultivated. It won’t tend to itself. It will not rise up and fight off its enemies. The healthy field needs a higher power to ensure its vitality. As do we need a Savior to work in us, through us and for us to thrive and bear much fruit. I learned this on the first day of Lent, in reading this wonderful collection of devotions by A.W. 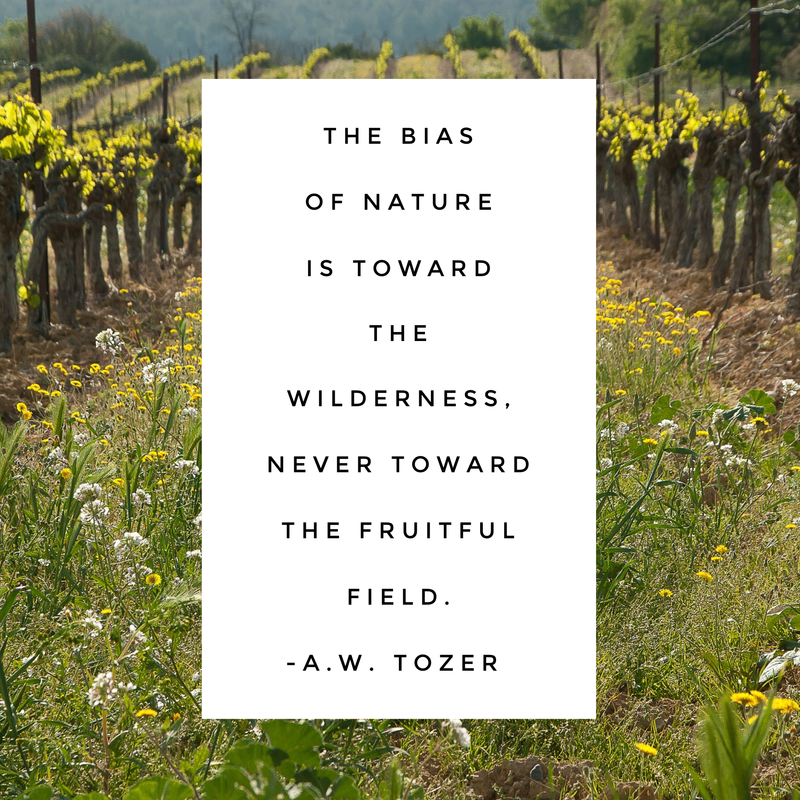 Tozer “From the Grave – a 40-Day Lent Devotional.” The idea is that, we can never stop cultivating anything of value. May it is be a farmer’s field, a growing business, or a child’s heart; anything that we invest in and see through to bearing fruit must continue to be cultivated and tended to, lest it fall back into the wild. Because the natural bent of all created things is to the wild. Wild and free sounds glamorous and exciting. And wild can have many connotations, to be sure! But wild in this context refers to weeds, to briars, to overgrowth of something NOT wanted, that hides, chokes and kills the very thing you worked so hard to cultivate. Today I am reminded to guard that which has been entrusted to me lest the thief comes to steal, kill and destroy the precious fields the Lord and I cultivated together. During Lent, I prepared room in my heart for the Holy Spirit to take up ever increasing residence. As I exchanged the temporal for the eternal, I experienced joy, peace, gentleness and the fruits of the Spirit that have always seemed so difficult to maintain. Largely because I was always striving, to manifest these fruits in my own strength when the real growing power comes from the Spirit that feeds and fuels the fruit. The temptation is to go back to the old ways, the easy familiar ways that distract me from the beauty of the fresh fields before me. But freedom is in walking further down the way of righteousness and remaining in my heavenly vine, in whom we can be branches that bear much fruit. This is my prayer today, for all of us who are seeking to bear much fruit.